Cancer is a group of diseases involving abnormal cell growth. Read this viral post to know the causes and how to avoid it in three easy steps. 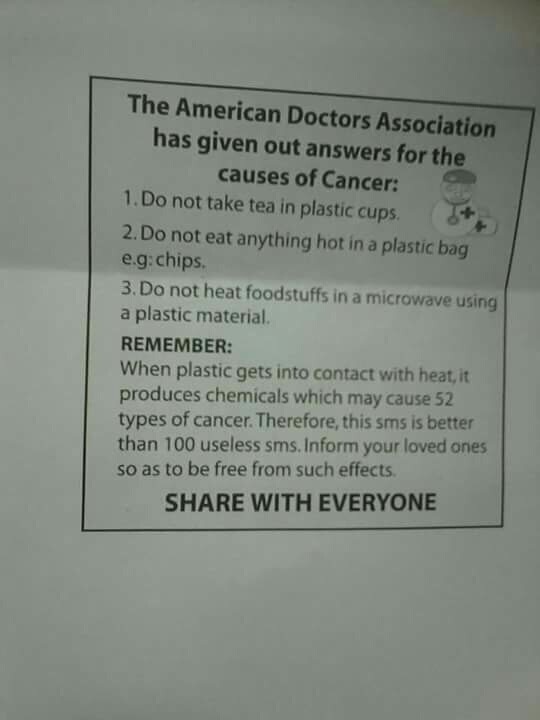 According to a poster snapshot shared on Facebook by a certain Silvana Diaz, the American Doctors Association has given out answers for the causes of cancer. Do not take tea in plastic cups. Do not eat anything hot in a plastic bag e.g: chips. Do not heat foodstuffs in a microwave using a plastic material. "Cancer is the natural reaction of our body to the toxicity level in our system. When the cells mutate the doctors diagnose it as cancer and prescribe surgery, chemo, or radiation. What the medical community refused to accept, even with solid success cases, is that cancer cells can revert back to its normal state with lifestyle change!" 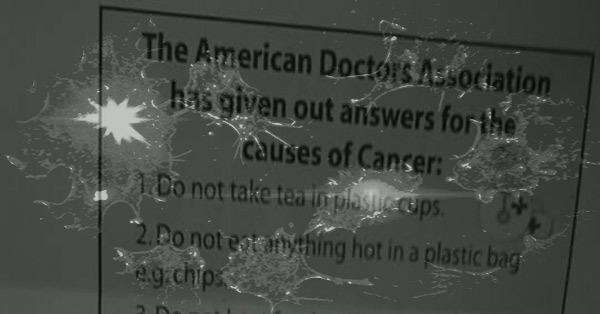 Aside from what's written above, the known causes of cancer according to the American Cancer Society include "genetic factors; lifestyle factors such as tobacco use, diet, and physical activity; certain types of infections; and environmental exposures to different types of chemicals and radiation." To lower the risk of getting cancer or keep cancer from developing, the National Cancer Institute advises people to maintain a healthy lifestyle and avoid exposure to known cancer-causing substances. Another goal is to detect and treat precancerous conditions (conditions that may become cancer) or early, asymptomatic cancer.